It’s finally, official now.Flipkart is ditching their website and embracing app-only shopping experience for their customers. 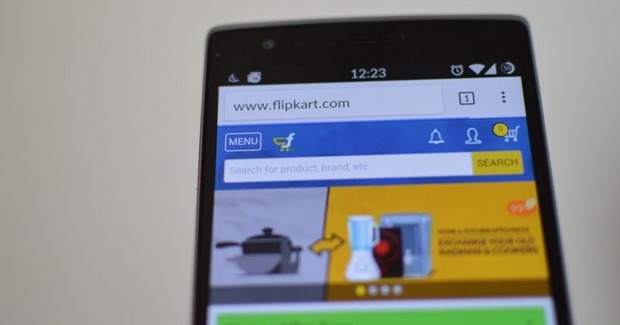 Flipkart’s Chief Product Office Punit Soni, in a recent meeting with employees, declared that from September onwards, Flipkart will only sell via mobile app and their website would stop functioning. This marks a historical moment in the nascent Indian ecommerce industry, considering that no other ecommerce player anywhere in the world has previously done this. After Flipkart acquired Myntra, they enforced this app-only mode after closing down Myntra’s website. Apprehensions were rife that Flipkart will also adapt a similar model, but how soon, nobody was aware. With this announcement, Ecommerce veterans are wondering if this decision can be the Waterloo moment for Flipkart? Major competitors of Flipkart: Amazon, Snapdeal and Ebay would be closely watching this development. Just last month, Amazon India had overtaken Flipkart to become the most visited ecommerce site in India. All major ecommerce players including Amazon, Snapdeal, Ebay, Jabong and more have repeatedly assured that they have no plans to enforce app-only diktat on their customers. As per them, customers should have the right to choose the platform on which they wish to make the purchase. While comparing traffic from mobile and website, it seems Flipkart had ignored the fact that majority of price comparison and product research happens on a website as its time consuming and tedious to do so on a mobile app. Further, the action to ‘make payment’ for a product on an app is only the last step in the whole chain of ecommerce buying process; in case the price sensitive Indian customer is not able to do a research for the product specifications and the pros and cons of the product, then it can become really difficult to make the purchasing decision. We had even shared some comments received from Flipkart and Myntra’s customers, wherein they have expressed their anger and frustration on this decision. Interestingly, Myntra reported a decline in 10% of sales immediately after they went mobile only earlier this year; despite the fact that prior to shutting down their website, they had reported 90% of traffic and 70% of sales from mobile. As of now, Flipkart registers 10 million hits a day from 45 million registered users. This year, they plan to double their GMV to $8 billion. But using only a mobile app only mode, will they be able to achieve this? Please share your views by commenting here. As someone who has purchased lakhs worth of products through their site, I won’t be going back to them anytime soon. When I buy expensive things like a laptop, I definitely want to see and compare features, prices etc. A website is the online version of a supermarket where you can see and feel things before buying whereas the app is just a small mom and pop store. its very bad.. flipkart lose customer soon..
How many buyers still remembers once they go app-only? How many people using smartphones in India? How many users have high internet speed in their smartphones? Ratio of buyers for mobile app and website? Well as a buyer i will definitely compare prices online. If i have to compare price in mobile app then i have to install Snapdeal, Amazon and Flipkart and each time i have to open various apps to compare price. They probably meant their mobile website, not the full version. Nope. The mobile website is removed long back. They have only desktop version and app now. Their move is to mobile app only just like Myntra! This is not a good decision to the customers. Flipkart plan to use this strategy for increase their sales, but here is the fact that if it is in desktop customer has more options and they can compare the products with various websites and finally they purchase the product with best price. Now come to the APP, customer dont have any options like that. He must buy the product from that app only. Jago grahak Jago. @Shaik Hussain: To stop price comparison and forcing users to select whatever listed in App without doing any research will normally increase sales. But smart user’s won’t use app for shopping until it comes with best discount. Their target via App is for hurry-burry people having lot of money who don’t have time for doing research on price and quality. So they don’t want smart users. Don’t worry we have Amazon, Snapdeal, Jobong, etc. flipkart is going to lose a lot of customers very soon….. it is a bad move by flipkart…. Flipkart will fall, most of the customers hate to shop on apps. What a amazing news for Amazon. Mobile app will definitely drop the users from rural area, because of slow bandwidth on mobiles. Earlier, I use to buy from Flipkart as I don’t like Snapdeal and product is not available on Amazon. Now, as I see there is not much I found only on Flipkart but not on Amazon. 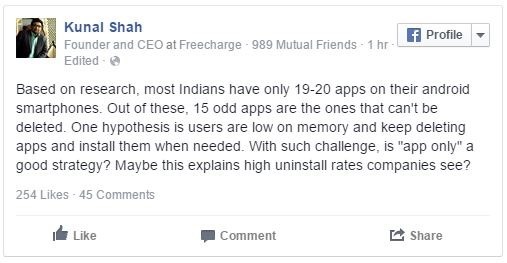 So, precisely, I don’t see any need to install their app when I have Amazon which is no less to customer care or price point. I forgot myntra and shopping on Jabong. It doesn’t take anything to me to forget flipkart and shop from Amazon. Good Luck to Flipkart. they just do not want you to compare prices with their competitors i feel. Flipkart must have researched this move before taking this desicion. I am sure their thinktank is aware of the consequences of going mobile-only. It’s not only about from where traffic is coming from right now , it could be about something entirely different which probably aligns with their long term vision and strategy. Maybe they will come up with something which none of us are thinking right now. Its a foolish decision to do this from biggest e-commerce website. I really like shopping through website as its easy to compare other websites price and also check products features and photos in big screen which is not possible in mobile phone. Hope they roll back this decision else they will lose many loyal customers like me.. In a recent survey, done by CouponRani.com, approximately 51% of consumers are not comfortable in shopping on the mobile app or mobile site. Shopping via desktop is still the most preferred medium. The biggest concern while shopping through the mobile app is the product viewing time. Flipkart will have to face major problem because of this move. This move may cause a loss of buyers who are using small screen mobile and low internet speed. I can say this is bold and stupid move. Now it is very easy for competitors like Amazon, Snapdeal, Jabong and eBay for putting their strong foot on desktop market. I used enjoy shopping at Myntra website. Their user layout, filtering options was very good to choose best products. But After App only model from Myntra, I never ordered from Myntra. Now Jabong and Amazon is doing great. No doubt that in some years Amazon will ditch Myntra and Flipkart.